1. Choose a nice magazine page and cut it down to 4 1/2" x 5 1/4." 2. Laminate it between two pieces of clear contact paper. 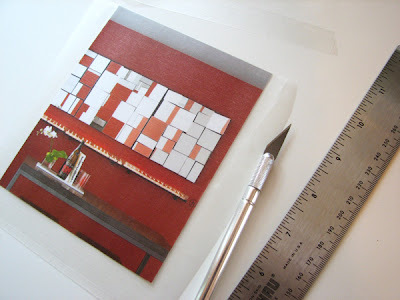 Burnish both sides with your thumbnail to get rid of any air bubbles, and trim off any overhanging contact paper. Score the piece horizontally across the middle and fold in half. 3. Cut a 4 1/2" x 2 3/8" rectangle from some clear vinyl (inexpensive, available by the yard at fabric stores). Put a couple miniscule pieces of double-stick tape in your seam allowance area and stick the vinyl rectangle to the inside of your business card holder. 4. With your sewing machine, sew around three edges of the vinyl to form a pocket. It's easier to sew on the contact paper side (less sticking to the presser foot), so mark your starting and stopping points and sew away. The vinyl side will tend to stick to the base of your sewing machine, so it helps to curl the unsewn part up, away from the machine as you sew. Tie off your seams by hand instead of backstitching. Round the corners if you like. Actually, yours are pretty cool. Nice idea. Very clever! Great use of materials too. wow, great tutorial! I love stuff like this! I noticed you have a etsy shop, my friends and I are hosting a boutique in December and are seeking promo items from etsy or other online sellers for goodie bags. about 20-25. Hope you can contribute...I'm a huge fan of your blog! Lay a piece of tissue paper on the exposed vinyl before you sew. With that between the vinyl and either the presser foot or the machine bed it will not stick. And the tissue tears off easily and cleanly when you're done. what a great idea and tutorial!! Barb, thanks for the tip! Love it! My husband made himself a beautiful rigid business card holder out of wood...this seems more my speed. Your ideas amaze me! This would be a great fathers day present that the kids and I could make together for my husband or even my father. Love it! this is a great idea! would be great for all my "frequent coffee drinker" cards. thanks! great idea an great job! thanks for the tips. Simply genius. It came out really good for your first vinyl sewing project! This project is awesome! Makes me want to go out and find some clear vinyl. Mine's from either Target or Home Depot, I forget. What a great idea, thanks! In college my sister and I used to use the jcrew catalog as envelopes to mail letters back to one another. This is really cute! Love the idea, might have to try it. Thanks for sharing! Thanks for the tutorial! Any tips on sewing through the contact paper? I get screwed up tension in my stitches, no matter how much I adjust my machine. Is it the needle do you think? I LOVE this!! Can't wait to try it. Love it! Reason to get myself finally a sewing machine! :) Thanks for the great tutorial! bless you. how did you know i needed a business card holder that was cuter than the random one i came home with from blogher? also? my sewing machine is sitting on my kitchen table right now, so this is fate. This is a really cool little project. And Barb's tissue paper tear-away idea is smart. Thanks for sharing. Dab your finger in baby powder and rub a light coat on the vinyl. Then wipe off after. First thing I always do is change the needle if I get tension problems. Recently, I changed needle thread, re-threaded, and then finally sent it to be serviced. Now it is purring and ready for all the Christmas presents to make. A good investment. ....I get screwed up tension in my stitches, no matter how much I adjust my machine. Is it the needle do you think? This is sooooo cute! I've made some out of Newspaper but I LOVE the magazine idea! Make sure you are using a Universal needle that is new. Lengthen the stitch length a bit, and test it out on scrap until you get a nice stitch. Try stitching with tissue paper or a product called Stitch 'n Ditch between the project and the feeddogs (stitch 'n ditch is the same paper your doc uses on the exam table and the paper used for toilet seat covers). The stitching will perforate the paper and it will remove easily. If you are still having tension problems, and you have tension problems sewing different weight fabrics, your machine may need a servicing. Great job. 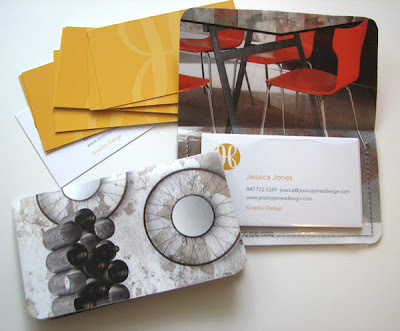 The most important part of the Business Card is not just the contact details but the graphic way in which they are conveyed. Hi Msagl, the first photo shows the finished product. There's a closed holder on the left, and an open holder on the right containing business cards.